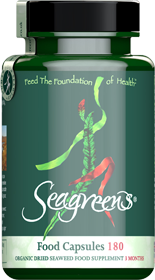 Seageens was formed in 1997 and its pioneering standards remain the benchmark for the production of seaweed for human consumption in Western Europe, rooted in the princiles of biodynamic, organic and sustainable agriculture, and the collection of wild foods. In 1998 it was the first producer in the British Isles to be certified to EU and US Organic Standards, and in 2016 first to achieve the international Nutritious Food Seaweed Standard which involves aspects of marine science, botany, nutrition and conservation. Within an international consortium encompassing production and worldwide markets, Seagreens operates a policy of transparency to its Partners and Customers, including global pricing and fair trading. The Crown Estate awarded the 2010 Business Award for Marine Enterprise to our (then) new production facility in Scotland, a few years after it was set up on the Isle of Lewis - the first time the seaweed biomass had ever been surveyed in its entirety. The Organic guideline is that "seaweed business operators shall by preference use renewable energy sources and re-cycle materials, and shall draw up as part of the sustainable management plan a waste reduction schedule to be put in place at the commencement of operations. Where possible, the use of residual heat shall be limited to energy from renewable sources". This rather flimsy requirement has long been surpassed under Seagreens own standard and is today reflected in the Nutritious Food Seaweed Quality Assurance Scheme and Standard developed with the Biodynamic Association by the Seaweed Health Foundation. In Iceland Seageens® are produced using natural, sustainable ground source heat. In Ireland and Scotland our consortium has developed completely sustainable ambient air circulation technology, and in Norway we continue to use the traditional production technologies which have sustained our pioneering productio of nutritious food seaweed over a quarter century. We put in place the Seaweed Health Foundation, and most recently the Seagreens Trust, which together with our Cusstomers and Partners worldwide will hpopefully sustain a wonderful new industry to benefit the millions yet to come. Seagreens consumer and healthcare products are filled into 100% recyclable, light-protective PET consumer jars with sealed screw top caps, fully compliant with EU FSA and US FDA packaging and labelling regulations. Packaging materials are certified free of any noxious compounds or heavy metals, being of pure chemical composition of the basic elements carbon, hydrogen and oxygen formed in a reaction between glycol and terephthalic acid. No chemical antioxidants, stabilisers or plasticisers are used. Whilst the jar is as clear as glass it is light-protective, pliable, shatterproof and virtually impermeable to contamaination. If burned instead of recylcled, it has a higher calorific value than paper almost as good as coal and releases no toxic elements.The jar can be crushed to minimum size for solid waste depositories or landfills with very slow decomposure and zero toxicity. All production, labelling and consumer information aims to comply with with international, EU, FSA and FDA regulations. Consumer products for wholesalers and retailers are supplied in strong shippable recycled corrugated cardboard trade cases containing 12 small jars or 6 large jars, and trade outers which contain 48 jars as 4 x 12 small or 8 x 6 large jars.